Christ can make hurdle jumping amazing! CONGO—I have never liked hurdles. In the eighth grade I used to run track. Once during a hurdle race I had a bad fall that tore up one side of my face and knocked out two of my front teeth. I still have some scars from it. Not a good memory! A hurdle race is tricky to run. I watched a couple of races during the Olympics, and cringed every time someone jumped, hoping no one would fall. You either confidently jump over them, or you hesitate and most likely will trip and fall. I usually just rather avoid them. Coming to Congo this time has felt like a hurdle run. Hurdles are pretty much a norm for Africa. Some of them these past days were very concrete, like having no electricity last night or Internet when I wanted to connect with my family. To take my African colleague’s wife to the hospital to get a malaria treatment, it meant driving down the streets of Kinshasa dodging potholes, broken down cars, and piles of trash on the road. Other hurdles are more mental and emotional. Mine these days were finding out that two of my colleagues were refused entry into Congo, and that I am now here alone and responsible for doing the teacher training. My initial reaction was to call Phil, cry a little, and tell him I want to come home. That is what I felt like doing! But a strange thing is happening tonight and I can only explain it as “Christ living in me.” All of a sudden I have peace. Yes, the one that “passes all understanding” that we read about in the Bible (Phil. 4:7). I read dozens of emails, What’sApp and Facebook messages that came in from friends encouraging me and praying for me. Tonight I don’t feel alone. So I’ve decided and I am going to take those hurdles straight on with confidence and courage because “He that is in me is greater than he that is in the world” (1 John 4:4). While sitting in the Addis Ababa airport on my way to Congo, I read these verses. They came just at the right time. Maybe some of you are running a kind of hurdle race right now. Go for it! “The Lord you God is with you, he is mighty to save. He will take great delight in you, he will quiet you with his love, he will rejoice over you with singing (Zeph. 3:17). I wrote this over a month ago (it’s now October). It was an incredible week of experiencing not only the Lord’s strength in my weakness, but him using exactly what I was afraid of for good. 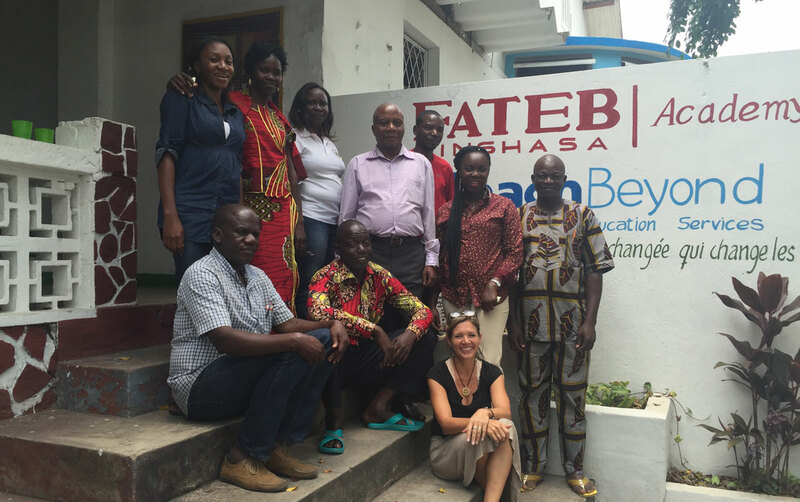 Because of being alone I was able to spend intensive time training not only the teachers of the FATEB Kinshasa Academy, but also spend time with teachers from war torn Central Africa Republic. They too hope to start a school with the help of TeachBeyond. Not being able to depend on my human resources made me dependent on the Lord’s guidance and leading to equip these teachers who will mostly work with traumatized children. So yes, jumping hurdles is scary, often difficult, and I still wouldn’t choose to do it; but when you have the Lord with you, He equips us with “Wings like Eagles” and that makes hurdle jumping amazing! Tamera and Phil Peters (Steinbach EMC) live in Germany and serve with Teach Beyond.